Some great camp sites around Merritt. Never a lack of things to do while out camping in the Nicola Valley. Camping in the Nicola Valley is by far one of the best pass times in the spring, summer and fall. You can start by checking all the provincial and forestry camp sites. There is a great map to look at and see what they have available at each. You can take a look at the interactive map from Ministry of Forests. From there it would be easy to decide on which site has what you are looking for in terms of hookups, power, showers, lake , fishing hiking etc. I have done this a couple times and it can be very convenient. I may decide to do this again one day. But right now I prefer a little more rustic way of camping in the Nicola Valley. It opens up so many more options and places that you can go. 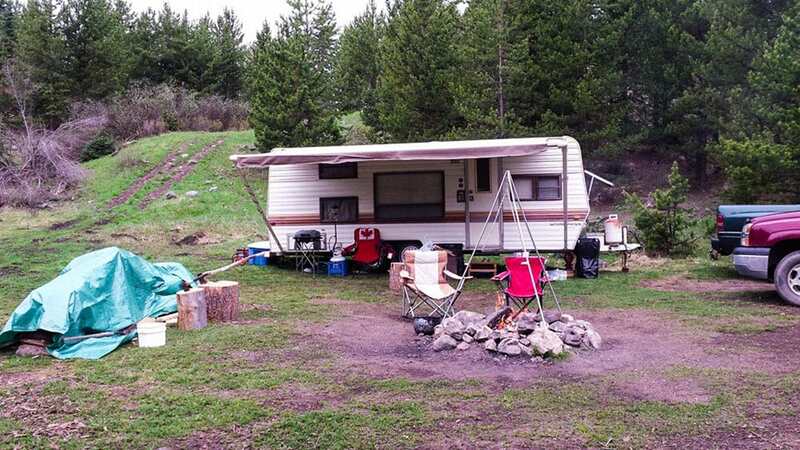 Some great provincial campsites around the Merritt area include Kentucky Alleyne. Located off of highway 5A between Merritt and Princeton. There are some great hiking trails, fishing and geocaching. There is also a great kids pond between the two lakes where children can fish in the stocked trout pond. Another great site is Monk park on the north west side of Nicola Lake. There is also great fishing here and if you have a boat you can get out into the deeper channels to fish. 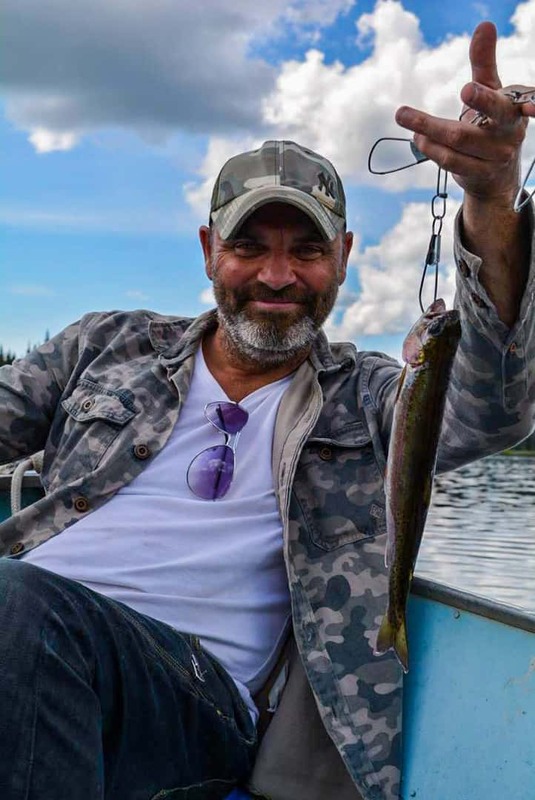 Rainbow, and kokanee are among the fish you can catch in Nicola Lake. You can get there by following highway 5 from Merritt towards Quilchena. Then take the Monk Park turn off just before the Nicola Lake dam. More rustic camping in the Nicola Valley. 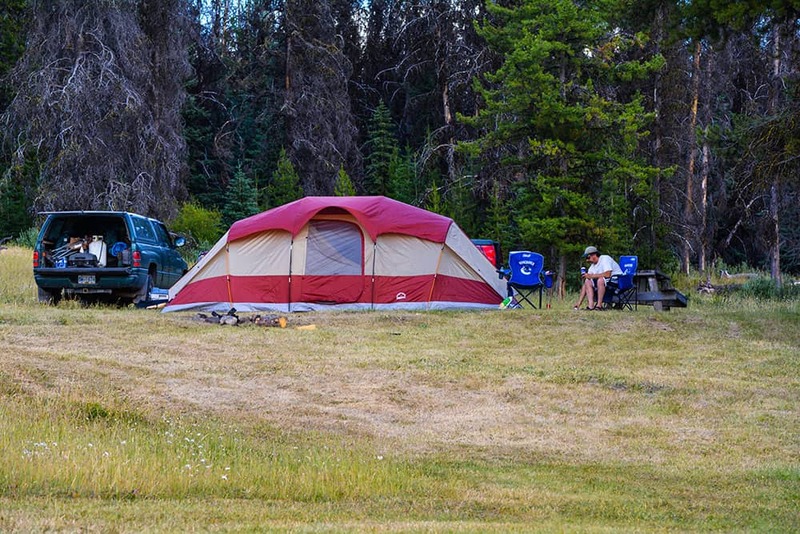 There are plenty of great forestry campsites through out the Nicola Valley as well. Some of them include Tyner, Boss, Shea, Davis, Kane, Lundbom, Marquart and so many more. Each of these lakes has it’s own pro’s. 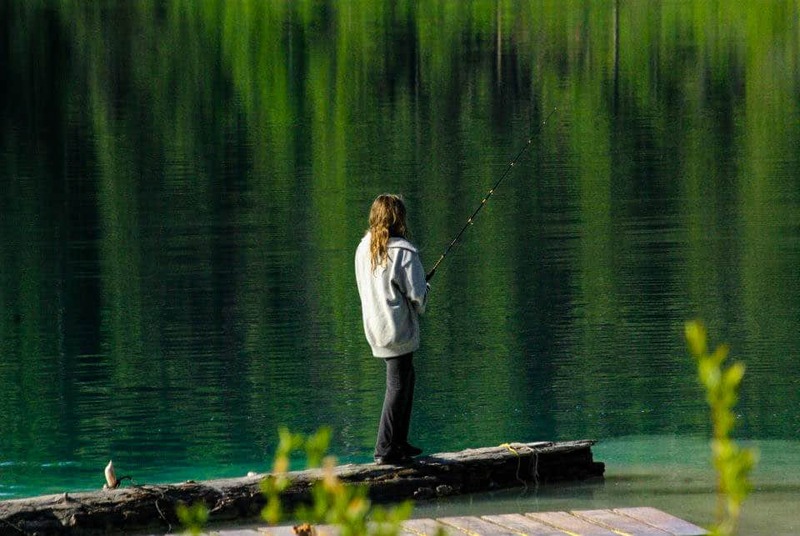 There are usually quite nice set ups for camping at all of these forestry sites and each lake has good fishing, trails and an abundance of wildlife. 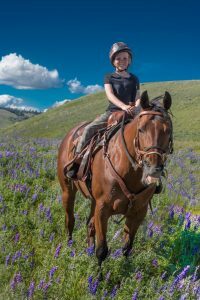 Lundbom is a great place to camp for those who love to take their horses along. There are corrals and some great trails and open range land. Makes for an amazing camping trip. We usually just drive to a nice spot in the bush by a lake and camp. No power, no hookups, no water. Sometimes we are not sure if our trailer will make it in but we do. If for some reason the road it not safe to take the trailer we will take the tent. Our trailer is always loaded with food. We always bring our own water, propane, battery or solar lights. We even make a portable out house. And last camping trip we lined the path to the outhouse with solar lights. It was great. All of these lakes would be great to take your canoe, kayak, boat, belly boat or even pontoon boat. They are all easy to access. There are so many lakes close to these lakes as well so you can travel a short distance to a new lake and a new experience. We love going fishing to catch our dinner or just catch and release. It’s all about getting out and enjoying the day. One lake we go to has a resident loon that will come and try to steal the fish right from the side of your boat or belly boat. You have to be very careful and keep a watch or your fish will either get taken or have some pretty good marks in it from the loon’s beak. It is quite exciting and kind of scary at the same time. 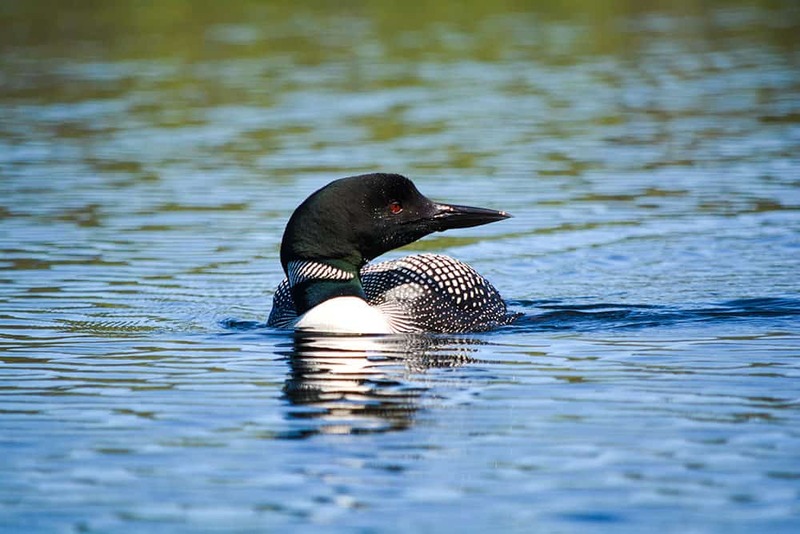 You can get some great photos of the loon though. 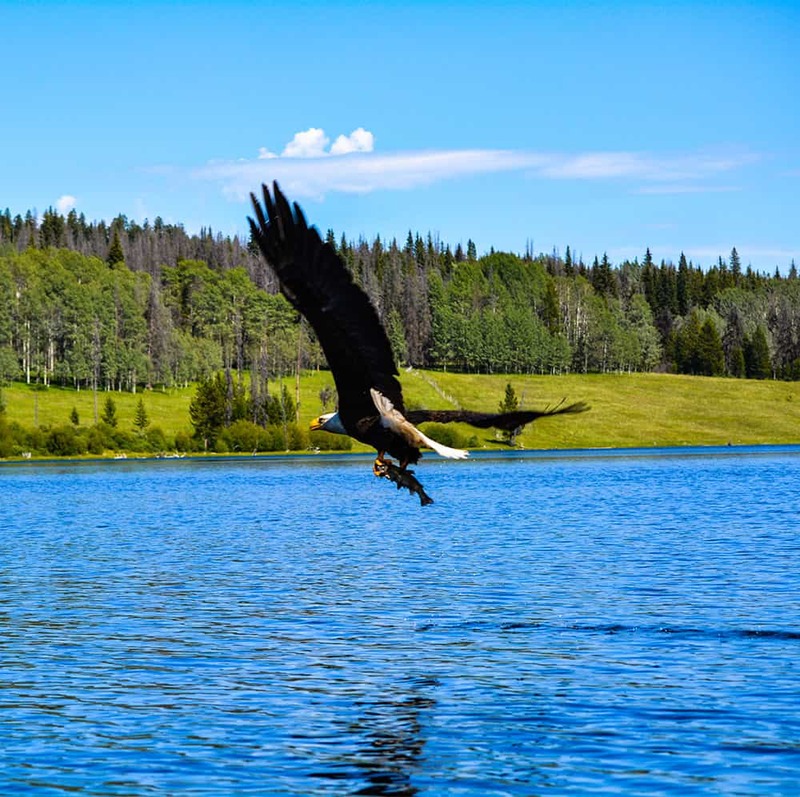 I remember another lake where you had to be careful as the resident bald eagle likes to come and steal the fish right off your line. Have to keep your eyes open and reel like crazy to get the fish in before the eagle steals it. It makes me laugh every time I think about it. Photo credit Michelle Lea’s photography. We are seriously so lucky to have what we have in our back yard. I remember setting up camp one summer and just going back and forth to work right from camp. 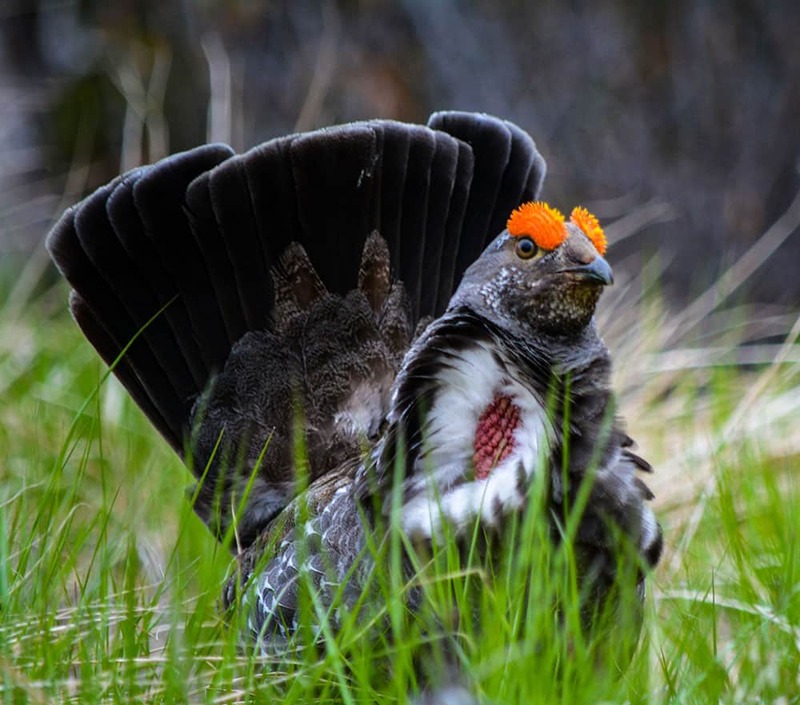 I have to tell you a fantastic little story about Bruce the spruce grouse. While out driving around, there is one road we always take to see what wildlife we can capture. Once particular day when we stopped at our normal corner I heard a grouse. I started to call it to see if it would come closer and what do you know. This grouse came right out strutting his stuff. He would follow me and even the truck for a little ways up the road. On our way back down I didn’t see the grouse again but told my boyfriend to stop and I would try calling him again. My boyfriend said no way is it going to come back again. I got out of the truck and started to call “Bruce…come on Bruce where are you” Well, wholly crap. Here comes Bruce strutting his stuff again. We couldn’t believe our eyes. I got a few more photo’s before heading home for the day. Thinking there is no possible way Bruce would still be there I decided to take my daughter for a ride up the road a week later. I needed some better photo’s. The ones I took the first time were not as good as I wanted. We got to the corner and I got out. My daughter must have though me to me crazy to be calling a grouse. “Bruce, come on Bruce, where are you” My daughter was just floored as out of the bush comes Bruce the Spruce. I got some better pictures this time. Had a little visit and left for home. When my boyfriend got home and I started to tell him that Bruce was still there. My boyfriends daughters were listening couldn’t believe that I was calling this grouse in. I let them know that we would go out again as soon as we could so they could also see. It wasn’t until a couple weeks later that we got to head out again. I thought for sure this time Bruce would be gone. But he was still there and came out when I called him. My step-daughters thought it was the craziest thing. I also thought it was pretty wild how this grouse would come out when I called it. He was there and kept coming out for about a month and a half. We would go up and visit for a while and get some photo’s and a couple video’s. I am not sure what ever happened to Bruce but he finally did disappear. It was a sad day when I went to see him and when I called he no longer came. I can only hope that he just moved on. I was pretty much ready to start planting a garden out there. Although we were back and forth I did plant some potato’s and lettuce. Our trailer stayed out there from April until the first snow in October. It was the best summer I have ever had. I think this year I will bring some planters out and have a bit of a container garden. Now we live on property and I thought by having property I wouldn’t want to go camping in the Nicola Valley anymore. So I started to get animals to sustain us on our own land. Well, I was wrong. I miss camping in the Nicola Valley. Quading, fishing going on hikes from out in the bush some where. There is absolutely nothing like it. 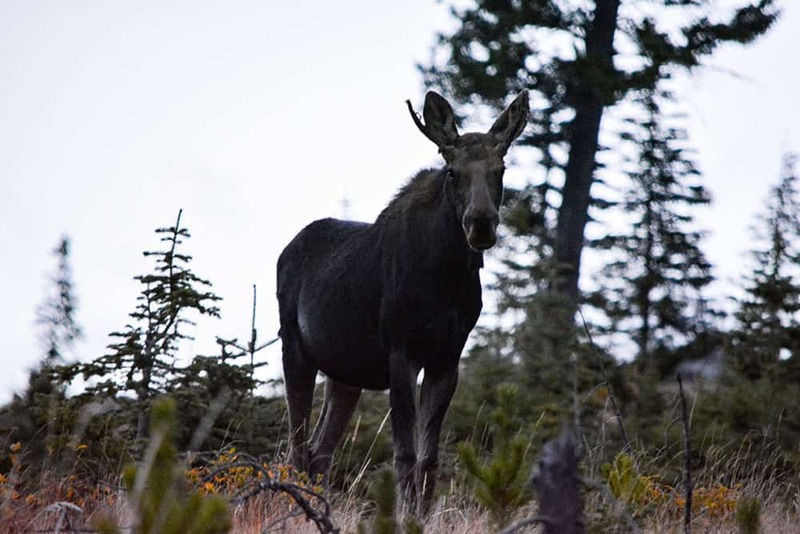 I love being able to see all the amazing wildlife when I am camping in the Nicola Valley. Usually we always camped at Helmer Lake. Unfortunately there was a bad flood that took out most of the camp sites as well as the road. Forestry has not fixed it for the past 3 years. So on to new and exciting places. We decided to sell all the animals so we can do some serious exploring again. Some of the lakes that we are looking forward to checking out this year are forestry camp sites. But that’s okay. I am looking forward to picking fresh berries and catching my supper again. Can’t wait to share with you all what I have experienced over the spring, summer and fall and which ones we love. There are so many places to check out when you go camping in the Nicola Valley. Some you may have heard about. Some maybe you haven’t. I will tell you about all of the ones I visit and what I see and experience at each. Please take care of our country so that others may also enjoy it for generations to come. I would like you to make a promise. When you go into the back country please, leave it like you were never there. Always make sure your camp fire is out before you leave. If you see someone else has left a mess behind, please make an effort to clean it up then make a note and message me at Experience Nicola Valley. I will make a point to go back and see if there is anything else I can do. Thank you all so much. 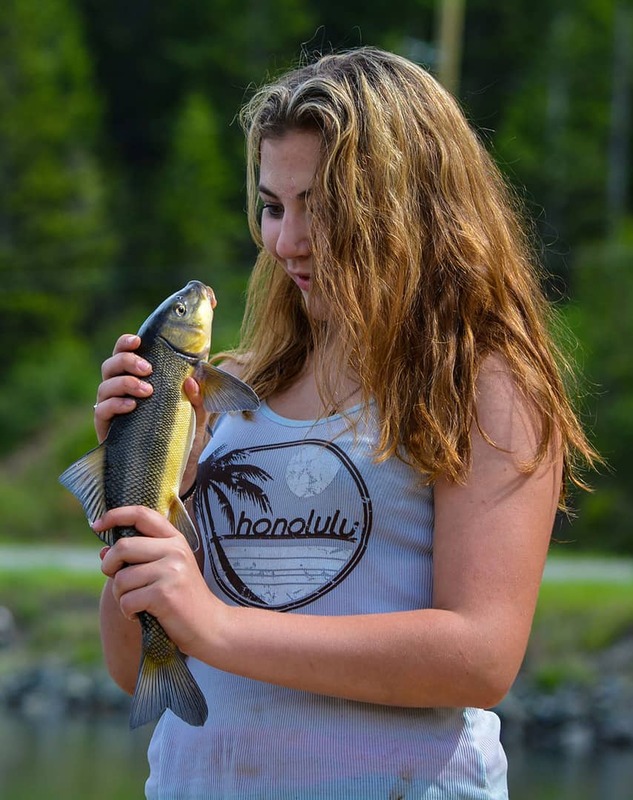 Experience Lundbom Lake in the Nicola Valley! Camping in Canada! 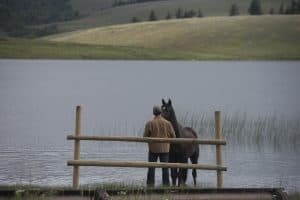 Lundbom Lake West Recreation Site, in British Columbia, is an awesome fishing, horseback riding, and camping location! Add the surrounding area which provides excellent mountain biking and ATV/dirt bike riding and you may never want to go home! Check out some exciting ways to experience Lundbom Lake! Come in the summer, come in the fall, this lake is fabulous any time at all. Each time I experience Lundbom Lake, I fall in love with it all over again! I know I’m just 15 minutes from downtown Merritt, but I feel like I’m miles away in the wilderness. Super easy to get to, it is just off Highway 97c on an easy-to-travel gravel road! Each summer I spend many weeks there enjoying all it has to offer, and even travel back and forth to work from my campsite! The short drive on the gravel road takes your breath away! 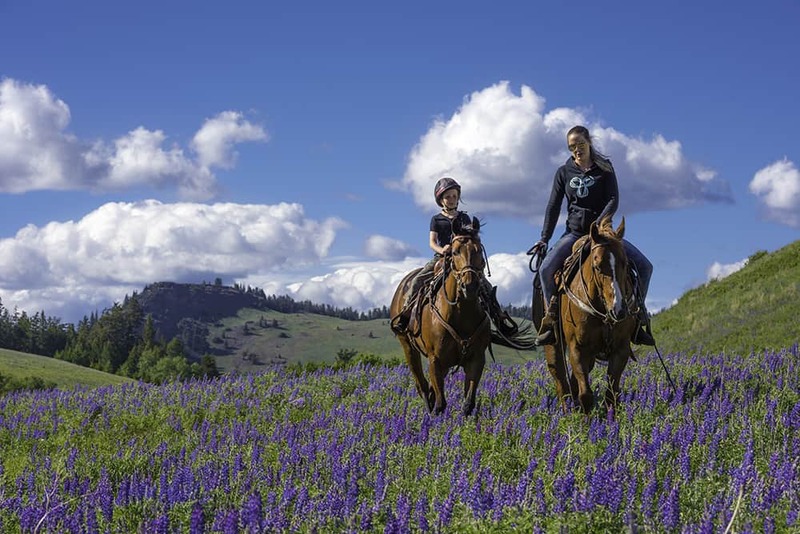 Rolling hills covered with wildflowers, sparkling lakes, and rich grasslands. Gorgeous! If you are planning on experiencing Lundbom Lake, you can also take the the back road through pine and fir forests and grassy, open meadows. There are a few extra bumps on this road, but is it worth it! Lundbom Lake camping will add additional camp sites this year, as the demand is growing! It is usually full on weekends and holidays, so reserve early. It’s pretty easy to find a nice camping spot during the week. This is a forestry campsite so there is a small fee for camping. Most of the sites are spacious and private, great for large RV’s, tents, and trailers! I have even seen motorcycle groups come and stay for overnighters. Several sites are right on the lake. Others are nestled in the forest. There are two areas for camping at Lundbom Lake, East and West. Stay on the main road to access the East side or cut through the west campground and take the back road thru the forest! You’ll find the campground hosts, Cathy and Clint, on the West site. Click here for a quick timelapse of the sun setting at Lundbom Lake! Beautiful! Horse people love it here! The West campground includes horse corals. “Build it and they will come.”, someone said. And they do! The draw? The never ending trail riding. And the trails really are never ending! Trails thru the grasslands up the mountains, by the lakes, and into the forests. Spectacular! My friend Joanne caught a beauty at our site. Be prepared to catch “the big one”! I have seen them as big as 9 lbs and they can get even bigger! 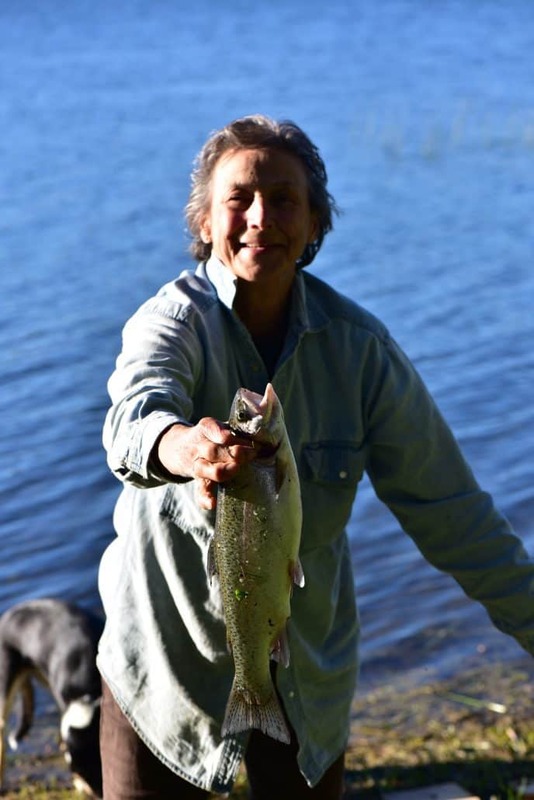 The lake is stocked with rainbow trout each year and there are plenty of fish to be caught here! Some days are a little tricky but when the bite is on, it’s on! Lundbom Lake can be challenging so the more fishing skills you have, the better your luck will be. I don’t consider my self a “pro”, but I’ve had pretty good luck right off the shore! To get specific information on the types and quantities, visit Freshwater Fisheries Society of BC. Fishing in the shoals on the west end of Lundbom Lake is a popular pastime. Lundbom Lake at it’s deepest is about 80 ft.
To find the history of Lundbom Lake, I reached out to Nicola Valley Museum and was thrilled with the response! They rock!! Special thanks to Emmanuelle Dugas! I had heard that the lake was named after a Lundbom. The lake is actually named after an early Nicola Valley settler, a Norwegian bachelor named Agustus William Lundbaum. In 1871, Lundbaum settled north of Nicola Lake. He was appointed Justice of the Peace in 1880 and a judge in the Court of Revision and Appeal under the Assessment Act for Nicola 1n 1881. Lundbaum was a great fisherman and is credited with introducing the angleworm into the district. Lundbom Lake was mainly known as Fishermans lake. It eventually became popular for just lazing around or hiking. Early campers said it was crawling with all kinds of insects, snakes, frogs, moles and coyotes. They said the fish were “small, silvery and saucy”. Sometime before Lundbaum left in 1885 or 1886, he declared the Nicola Country was “going to the dogs” and “the grass was about done”. He rode the range, with his rifle, shooting down his heifer calves so that as he put it, “ there would be enough grass grow” for those he allowed to survive. Lundbaum was so concerned about the overgrazing of the Nicola Rangeland that it is said he went out of his mind and was taken out of the valley, never to return. He apparently recovered and farmed in the Fraser Valley. Ridley and Pooley staked a claim and applied to purchase the open country. This action resulted in the Stockmen from Nicola Lake signing a petition to the government to have the area declared a commonage reserve under the Commonage Act. The commonage bearing Agustus William Lundbaum’s name still exists as established in 1887 and is a fitting monument to this early environmentalist. It is a commonage reserve to this day. Lundbom Commanage contains 100 acres. Lundbom Head, sometimes called Sugar Loaf Mountain, stands in the Lundbom Commons. 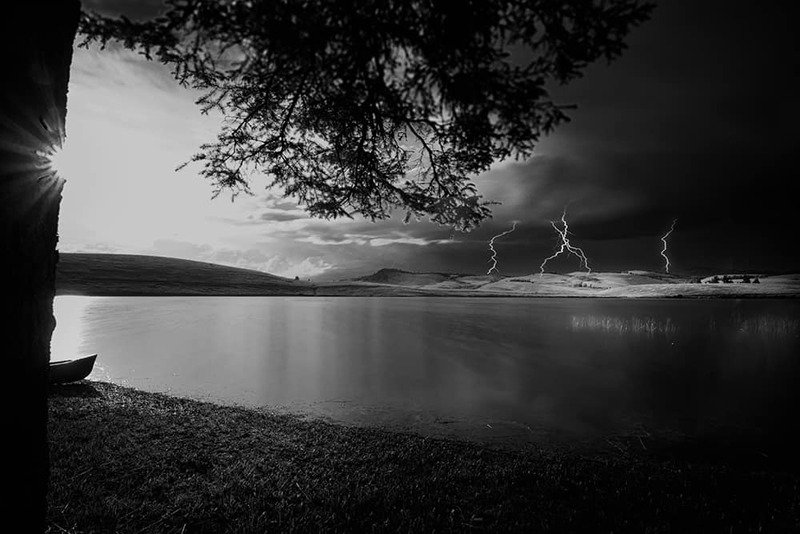 Now visitors from far and wide enjoy the Lundbom Lake experience! Turquoise waters at Lundbom Lake? But always be careful and be safe! Wildfires are always an issue during the hot summer months. I remember when Lundbom Lake used to be turquoise waters. Anyone else remember that? And know why it’s not anymore?